Nominate a hero of child, youth and family services for 2014 awards. 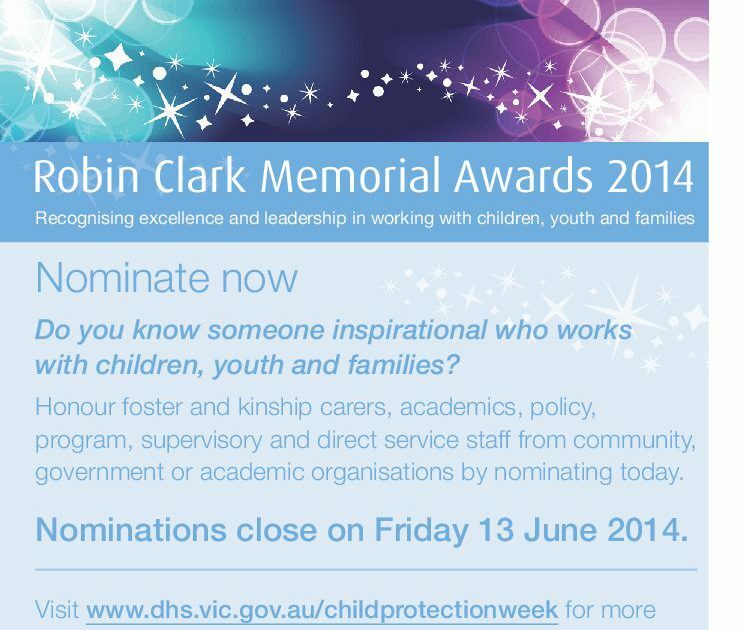 The Victorian Government is calling for nominations for the Robin Clark Memorial Awards 2014. Nominations are sought for individuals, teams and groups who have made a difference to the lives of vulnerable children, young people and families through their work in Victoria. The annual awards are held during Child Protection Week to celebrate the varied work taking place across government, the child, youth and family service sector, academia and the broader community to ensure the safety and wellbeing of children and young people. Nominees may be foster or kinship carers, or involved in direct service, supervisory, program, policy or academic work that has had a positive impact on the lives of vulnerable children, young people and families. Help to shine a light on the exceptional contribution of those who work each day to improve outcomes for some of the most vulnerable people in our community by nominating today. Nominations are open until Friday, 13 June 2014. Visit the Department of Human Services Child Protection Week page for more information about the awards or to make a nomination.